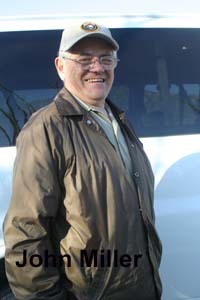 One does not have to leave special interests, hobbies, and talents behind to move into an RV, full-time or part-time. We carry with us a full-sized keyboard, a hammered dulcimer, two mountain dulcimers, and a trumpet. At times, we’ve added a full-sized harp, a mandolin, and guitar. 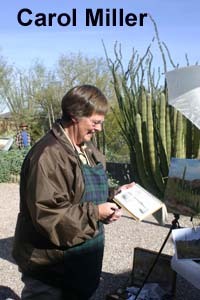 Others pack sewing machines, fabric, and items for crafts. Some take along wood working tools. No matter the interest, RVers have a unique knack for finding space for their special things inside their rolling homes. 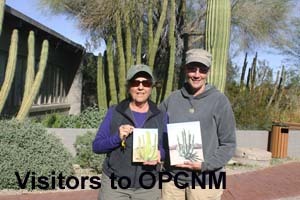 While Carol painted on a sunny January morning, two visitors came in, each holding a small oil painting of their interpretation of the organ pipe cactus. 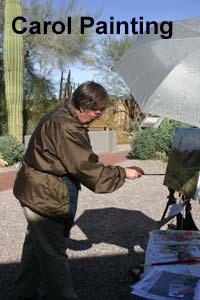 Knowing that Carol was there, they came to share how they had been inspired to take up oil painting while on the road. No matter what one likes to do: carve wood, paint pictures, quilt blankets, sew garments, braid rugs, make jewelry, play music, or write stories; there is a way to combine it with travel. And for certain, you will find others with whom to share your interests. You can take who you are on the road!